Also referred to as welts or urticaria, hives are characterized by swelling in certain areas of the skin. These swollen parts are at times itchy. Hives can be of different sizes and shapes, and are characterized by their central, pale raised areas surrounded by a red ring. While hives are common, they are not contagious. Hives last for a few hours, and at times they can take days to clear. However, it is possible for one to have hives for months even though it is rare. 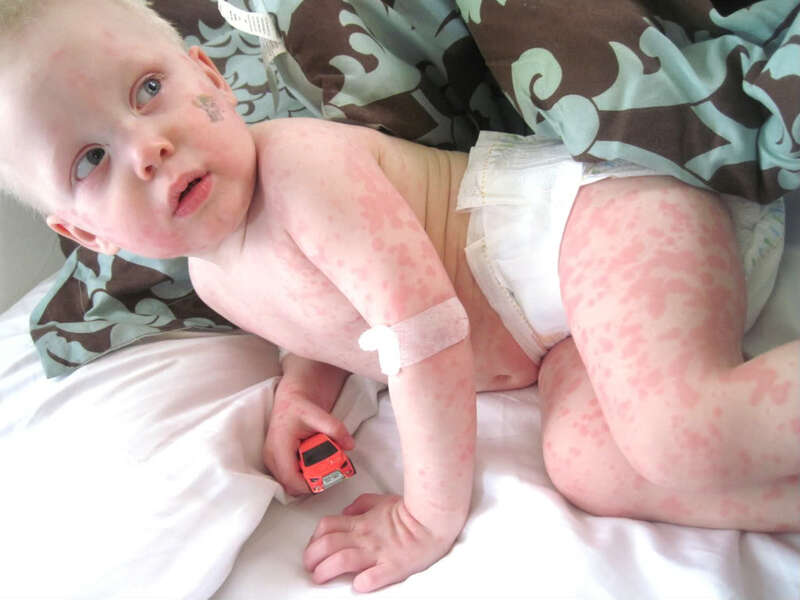 Learning about the causes of hives in toddlers can help you better treat this condition. In serious cases, medical treatment is needed. Hives appear when the body releases histamine. Still, there are many possible causes of hives making it hard to establish the cause of each case. The most likely causes are listed below. If your child suffers from allergies from fire ants or bees, it possible that they may develop hives if they are stung or bitten. It is possible for children to develop hives from foods they eat. The most likely causes include milk, peanuts, eggs, soybeans, tree nuts, shellfish and whitefish. There are food additives and preservatives that can causes hives. It is also possible for your child to develop hives from eating foods with protein, or it could be because the food has a chemical that triggers the release of histamine. There are some children who develop hives by coming into contact with certain foods, like when strawberry juice comes into contact with the child’s skin for example. It is possible for a child to develop hives when they fall ill especially from a viral infection. Though not common, it is also possible to develop hives from a bacterial infection. It is possible to develop hives from cold temperatures. Also, sudden temperature changes can also cause hives. Children who are allergic to substances can develop hives when they come into contact with the particular substance they are allergic to. Antibiotics and other types of medications can cause hives. It is possible that your child has hives if you notice some raised and swollen parts of their skin that are itchy. Hives can appear on any body part. They can last between a few hours and a few days. To establish whether your baby has hives, you should look out for the following signs. Sudden development of small raised patches that are at least 1cm to 2cm wide. These patches, known as wheals, can be red or white in color, are itchy and surrounded by a red rush. These wheals can merge to look like extensive patches on the skin. Hives are quite common amongst young children. It is estimated that one in every five children is likely to suffer from hives in their lifetime. It is possible for the hives to disappear after a few days. However, if your child suffers from itchiness and irritation because of the hives, it is best to consult a doctor. The doctor is likely to prescribe antihistamine medicine to reduce the itching and swelling. If the case is very severe, the child may also need to take corticosteroid tablets. It is important to treat your child with antihistamine medicine as soon as you realize they are developing hives. This will prevent the symptoms from getting worse. Ensure you administer the medicine based on your child’s age. You can give a dose of the medicine after every six hours as this reduces the swelling and itching. Consult your doctor about this. You can use an ointment made from colloidal oatmeal or aloe vera to soothe the itching. Applying ice cubes directly on the hives to lessen the swelling. It is important to dress the child in loose clothes made of cotton. Wearing tight and warm clothing can cause the hives to spread, causing discomfort in your child. An oatmeal bath soothes irritated skin and reduces inflammation. You can get readily prepared colloidal oatmeal mixtures in stores. These are in the form of bath soaks. The hives may have been triggered by something that irritated the skin. Once you realize your child is suddenly developing hives, you need to give them a bath to remove the likely cause. You can treat the itching with a mixture of water and baking soda, or with calamine lotion. You can also apply cool, wet compresses. Cover the areas affected with bandages and dressing to soothe the skin and prevent scratching. It is also possible to give the child a comfortable cool bath. Sprinkle some baking soda or oatmeal in the water. It is best to try using alternative skincare products and detergents as they may be the cause of the hives. Using non-biological washing powder and baby cleansers or soaps is best for your baby’s skin. These can include medication, food or natural conditions like extreme temperatures that can trigger allergies. If you suspect that certain foods are causing the hives, you can start keeping a record of the foods you feed your child on. This will make it easy for you to determine the exact foods causing the hives.